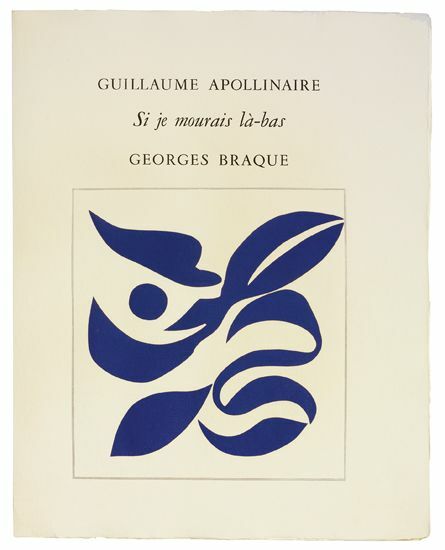 Guillaume Apollinaire, Si je mourais là-bas (Paris, Louis Broder, 1962). Illustrated by Georges Braque. Charles d’Orléans. Poèmes. 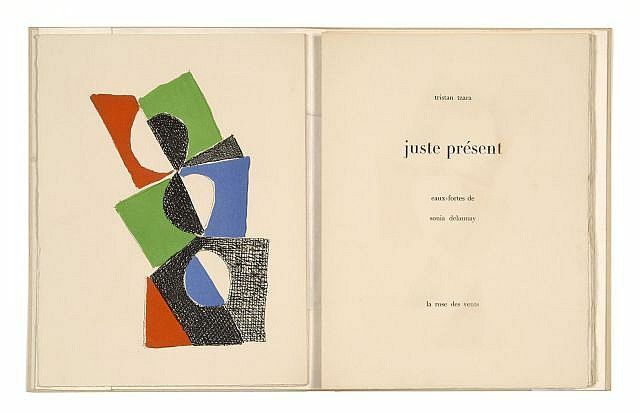 Illustrated by Henri Matisse (Paris: Tériade, 1950). 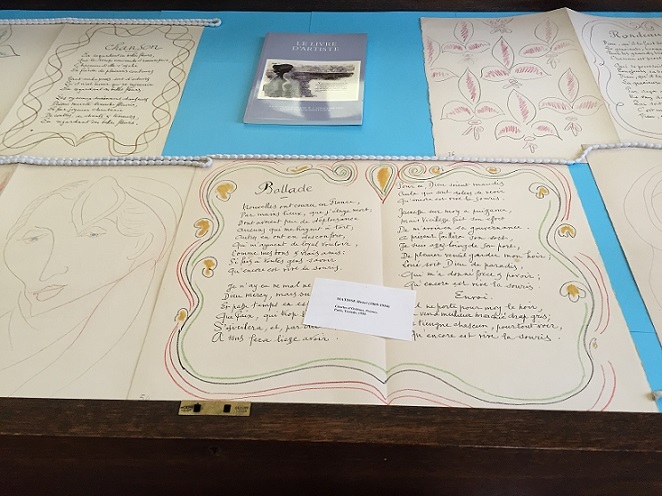 Dr Mathieu’s presentation was accompanied by a display, in the Taylorian’s Voltaire Room, of related items in the artists’ books collection. The following is her summary of her talk. As far as objets d’arts go, the artist’s book is a rather hybrid form. It turns a story or a poem into an object; it lends the weight of materiality to the metaphorical weight of narrative. It is necessarily a collaborative effort: author, artist-illustrator, typesetter, printer, editor, publisher—all of these people have a hand in producing the final product. It can be presented materially—as a bound book where only one page can be opened at a time—or immaterially, as a series of leaves and pages that feed into one another. 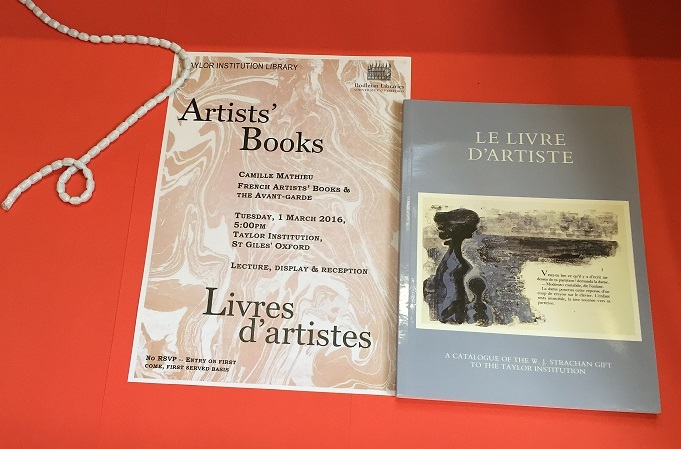 It was its hybridity as a medium that drew Walter Strachan to the artist’s book; his impressive collection of sheets from these books was given to the Taylorian during Giles Barber’s tenure as Taylor Librarian (1970-1996). 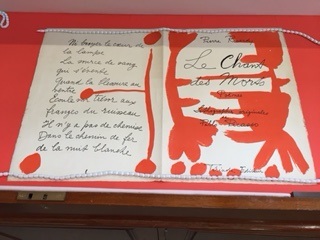 A teacher of modern languages at Bishop’s Stortford College, Walter Strachan became interested in the genre of the artist’s book (or, in its French translation, livre d’artiste) in parallel with translations he was executing of the works of poets who inhabited Paris during the first decades of the twentieth century – Tzara, Eluard, and Apollinaire, for example, whose texts ultimately featured in Strachan’s collection. Amassed in repeated visits to Parisian collectors, printers, and book artists and sometimes offered to the collector as gifts over several decades, the Strachan Collection is extremely diverse both in terms of the artists and the authors it represents. It contains two of the most important works for the history and development of the genre, both of whose process of publication was spearheaded and supervised by the legendary post-impressionist art dealer (his “stable” included Cézanne, Renoir, Gauguin, Van Gogh) and book editeur Ambroise Vollard (1866-1939). 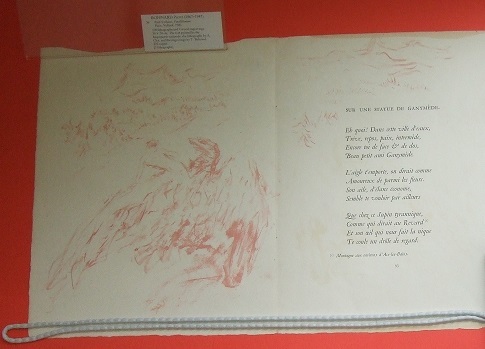 The collection includes two Vollard items — see below images: (1) What is arguably the first artist’s book ever produced in the avant-garde, early twentieth-century sense of the genre that Strachan devoted his scholarship to: Verlaine’s Parallèlement, illustrated by Pierre Bonnard (1900); and (2) Balzac’s Le Chef d’Oeuvre Inconnu, illustrated by Pablo Picasso (1931). Each artist takes a different approach to the concept of illustrating the book. Bonnard’s work is arguably the more innovatively designed of the two, for his illustrations encircle the text, as opposed to providing separate, squared-off vignettes of illustration to the text, as is the case in Picasso’s work. The rose-colored, frenetic drawing style exhibited by Bonnard in Parallèlement lends the entire production the feeling of being illustrated with sanguine chalk—a feature frequently associated in the late-nineteenth century with the Rococo drawings of Fragonard or Watteau. This drawing style claims for the art book the purview of the luxury product. Both Bonnard’s and Picasso’s drawings are more or less illustrative of the actual texts, providing images that generally coincide with the development of the narratives provided. 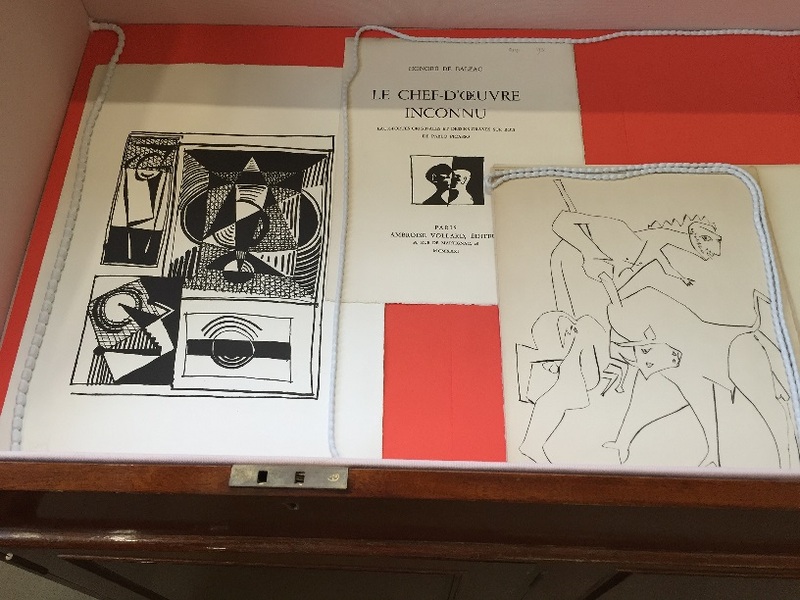 In the case of the 1931 Chef d’Oeuvre Inconnu, the first artist’s book ever to be commissioned from Picasso—an artist who would go on to be prolific in the genre—the illustrations go one step further and take the power of mimesis and the pull of abstraction as their subjects; these are both underlying concepts in Balzac’s narrative as well as powerful motivators for the work of Picasso in the 1930s. For the man who had invented Cubism (along with Braque) and whose art was currently in a broadly neoclassical phase, the importance of reconciling the live model with a kind of abstracted ideal retained all of the force with which Balzac presents it. Picasso’s illustrations include both the more traditionally representative (the painter drawing his model) and abstract (the set of line-dot drawings that dominate the “introduction” he provides for the reader [not part of the Taylorian’ sheets from this book). The successful marriage of disparate parts and influences that is represented by the genre of the artist’s book— edited, authored, illustrated, printed, etched/engraved/lithographed, and published by a litany of different people with disparate ideas—ironically finds its fullest and arguably most famous expression in this particular livre, whose text and illustrations both insist on the inability of the painter to successfully bind together the real and the ideal. Le livre d’artiste: a catalogue of the W.J. Strachan gift to the Taylor Institution: exhibited at the Ashmolean Museum, Ox, 1987 (Oxford: Ashmolean Museum and Taylor Institution, 1987).